This post features Elenor Collings of Bandcast, and is part of our Twilio Customer Highlights series. 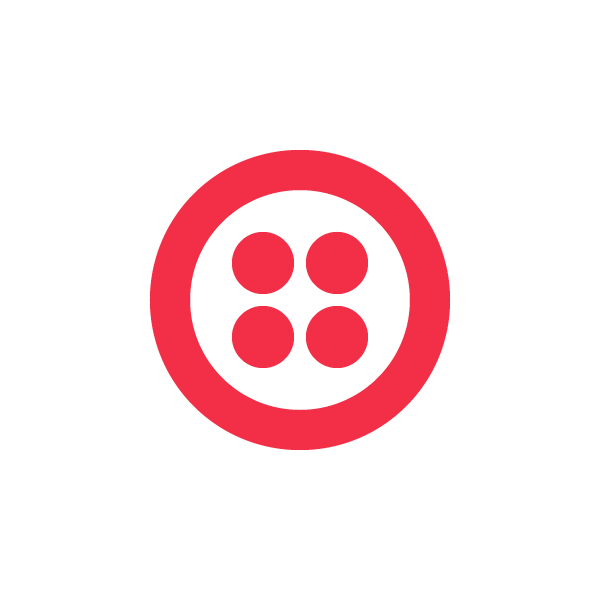 Have you built an application using Twilio that you’d like to see featured on our blog? Drop a note to help@twilio.com, we’d love to hear from you. 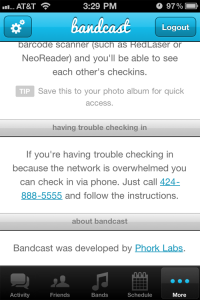 Bandcast is a mobile web application that uses Twilio to help you organize and connect with your friends at the iconic music festival Lollapalooza, August 5-7, 2011 in Chicago, IL. You can send status updates, tips and private messages, share schedules, find friends, and easily connect with new friends by scanning their unique QR code provided by the app. Unlike other social networks, Bandcast is tailored specifically to Lollapalooza so you won’t have to filter out the noise of non-Lollapalooza status updates. Most of the problems I’ve had at Lollapalooza revolve around trying to meet up with friends at the different stages throughout the day, which is sometimes complicated by the cell phone data networks getting overloaded. Bandcast lets you add friends and plan your schedule beforehand, and then when you get to the festival you can check into bands and stages, see where your friends have checked in or where they’ll be next, and send private or group messages. There are obviously several messaging and check in apps out there already but the goal of Bandcast is to filter out all the noise from people not at the festival. What technologies are you using to build and support Bandcast? The mobile application is built with Sencha Touch. The back end uses Phork, which is my own PHP framework, and the event data comes from DoStuff Media’s Lollapalooza API. It also uses QR codes from Google Charts so you can scan someone’s code and immediately become friends with them. And there’s a non-mobile dashboard that’s built with Phork/it and jQuery that uses Facebook Connect to find your friends. I used Twilio as an additional check in mechanism so if the data networks go down you can still check in over the voice network, and you can have your friends’ last 10 posts read back to you. How was the experience of integrating Twilio? I loved it. It was incredibly easy to use thanks to the Twilio PHP Library, the documentation was fantastic, and it was fun to work out how to port a standard website flow and login system to an all voice prompt system. I can’t wait to work with Twilio again. How did you get started developing with Twilio? I first heard about Twilio at Startup Weekend last year. I’d seen what my friends had done with it and was really excited to try it out, but I hadn’t had the right opportunity to use it until this project came up. What are your future plans for Bandcast? I’d like to expand it so it can be used with other events like conferences, other music festivals, or really any event where you’re likely to meet up with people and make new friends. I’d also like to port it over from a mobile web app to a native app for both iPhone and Android. Thanks for sharing your story with us, Elenor! If you want to learn more about Bandcast, visit the website or send Elenor a tweet: @e1en0r. Good luck with Bandcast and we look forward to watching it evolve!